Written by Guest reviewer on Wednesday, 22 November 2017. Subtitled The easy beginner’s guide for Australian cooks, it’s probably a good one to hand to your offspring as they head off to their new, independent lives away from home. When I was asked to review this book I had never heard of Matt Okine. I guess that means that I am not the target audience for this book. I had to search the net to find out that he is a Triple J presenter who also presents the ABC series with the same name as this book. According to his introduction he is a Master presenter and apprentice chef! As far as I can see the only part of the book he has written is the introduction, though he appears in the photographs throughout the book. The rest of the book is divided into different recipe categories such as the Basics, Date Night, Comfort Food etc. The book is beautifully photographed and designed and the recipes are clear and easy to follow. The best part is, Kitchen 101. It covers everything a person who can only wield a can opener needs. I disliked the pretentious clichés in the introduction like “I grew up around food”. Which of us didn’t? I also disliked the fact that this looks a marketing driven project. A sort of “let’s get a whole pack of celebrity chefs and a presenter the millennials will identify with and make a TV series and spin-off book”. Look, that may be cynical but I worked in advertising and marketing for many years and this has all the hallmarks of a marketing project. There’s nothing really special about the recipes but many of them could be useful to a person starting out on their own for the first time. They even include how to boil an egg. That said I think they might have missed the characteristics of their market. There are many ways to soft boil an egg but I don’t know any young person who will remember to take the egg out of the fridge the night before they need it so it will be at room temperature; or, if they forget, stand, holding it under the tap until it is no longer cold. Then they need a nail or a pin to carefully make a hole in the air sac! I rest my case. A couple of other recipes I have issues with are the so-called Hearty, Healthy Chicken Soup and the Maple Glazed Pumpkin Salad. The soup recipe calls for you to start it the day before you need it! That requires knowing you want chicken soup for dinner a day ahead, not easy for a young person juggling Uni, a job, flatmates who also want to use the kitchen and shopping for ingredients. The photograph shows a clear yellow liquid with five lumps of carrot and a sprinkle of dill in a soup plate. To me, a hearty soup is a thick, filling soup like the picture below. This clear soup may taste exquisite but it looks like a lot of work for something that is going to leave you hungry. The Maple Glazed Pumpkin Salad takes 15 minutes prep time and 2 hours to cook. I’m sorry I don’t see the audience for this book being bothered with that. It is just a salad after all. If you know someone who doesn’t know how to cook (maybe they didn’t “grow up around food” like Matt Okine) and who is striking out on their own then this is a handy and very attractive book. The Kitchen 101 section is worth the price of the book and the recipes are a bonus. Maybe a good Christmas present. 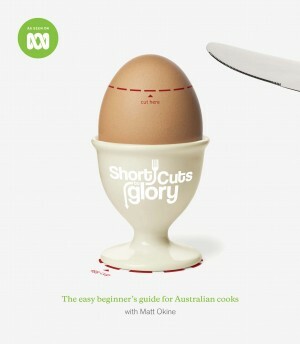 Short Cuts to Glory is published by Echo Publishing has 232 pages and a flexicover format and the RRP is A$29.99. It is available at ABC and other bookshops or online from The Book Depository for A$22.43 including postage. Thanks to Munaiba Khan, a retired naturopath with an interest in nutrition (and a former partner in an advertising and marketing agency for several years) for this review.